We’d love your help. Let us know what’s wrong with this preview of Take a Bow by Elizabeth Eulberg. Carter is a victim of a particular Hollywood curse: Chasing fame. Ethan has his own issues - a darkness in his head that he just can't shake. He's managed to sabotage every relationship he's ever been in. Emme's the only girl he's ever really respected... but he's not sure what to do about that. To ask other readers questions about Take a Bow, please sign up. What are the names of all the band members? I remember Emme and Ethan, of course, but I can't remember the other two! Rebekah The band members are: Emme, Ethan, Ben, and Jack. Rebekah Check your local library to see if you can check out e-books through them (you'll need a library card for that) or purchase it from Amazon/Kindle. You know those books that are so adorable, so sweet, so subtly inspiring that they make you want to hug the author and all of the people involved in publishing them? Take a Bow is one of those books! My first thought after reading this was that I wanted to become a singer — which is completely untrue because I'm a writer-girl, and singing and I don't go together unless it involves broken windows. But Elizabeth Eulberg wrote this novel in a way that made me want to jump in and follow these four te You know those books that are so adorable, so sweet, so subtly inspiring that they make you want to hug the author and all of the people involved in publishing them? Take a Bow is one of those books! My first thought after reading this was that I wanted to become a singer — which is completely untrue because I'm a writer-girl, and singing and I don't go together unless it involves broken windows. But Elizabeth Eulberg wrote this novel in a way that made me want to jump in and follow these four teenagers on their aspiring path to stardom. Take a Bow is told through four alternating perspectives, which I originally thought would be confusing, but it works for this book! The four teens are so different, both in personalities and aspirations, but their stories are weaved together perfectly. Each of them are real and imperfect and relatable. I was surprised by how quickly I became attached to all of them, and how invested I became in rooting for them to reach their dreams. The plot is so well-paced that you will undoubtedly finish this book in one sitting. And the music aspect was brilliant. Even if you can't really hear the music, you'll feel like you're soaking up in the melody anyways because of the flawless way the author described it. Beautifully written and full of heart, Take a Bow is a book that will bring a smile to your face and make you want to pursue your craziest dream. I'd recommend it to all wholeheartedly! BUY or BORROW? : This book is made for those days when you just want to read something that's sweet and awesome and smile-worthy. That makes it buy-worthy, in my opinion! P.S. I usually don't include quotes in my reviews, but I just wanted to give you a taste of the awesomeness I'm trying to explain. Here's one from Carter's point of view! "My diet has been a serious topic lately since the producers feel the need for my character to appear shirtless. A lot. Because most seventeen-year-old guys hang out at home in khakis and nothing else. In one scene, I take off my shirt before I open up a book. I don't get it, but apparently the viewers like it. It's beyond embarrassing." I'll just start by saying this: the book was beautiful. I've read a few Elizabeth Eulberg books before and I can say with absolute certainty that none of them could quite compare to Take A Bow. I'll admit, I was initially skeptic about this one. Considering The Lonely Hearts Club and Prom and Prejudice I didn't actually expect much from this. If anything, I imagined this to be just as flat and lifeless. Maybe even worse, after I saw the format of the book: four different POVs. The only thought th I'll just start by saying this: the book was beautiful. I've read a few Elizabeth Eulberg books before and I can say with absolute certainty that none of them could quite compare to Take A Bow. The only thought that ran through my head when I got started on Take A Bow was, She's going to mess this one up. All the characters are going to sound the same, I'm not going to be able to tell the difference, I'm not going to like it. How are you supposed to keep track of all four POVs? But I take that back. Because Elizabeth Eulberg pulled it off with grace and near perfection. I loved that which each chapter, I didn't have to look up to see whose POV I was reading. I just had to read the first few lines and I got it. The characters were defined, clear-cut and more than anything, believable. Charismatic, mean-girl Sophie; naive, I'm-still-getting-there Emme; real, honest Carter and oh, don't even get me started on Ethan. It's like each chapter sends in a wave of emotions through me, each one so different, so vigorous and so alive. It's rare thing to get to read a book that gives you more than what you expected but this one nailed it, hands down. But above all, it's the story that makes me want to widen my eyes, drink in the words on each page and live a part of the story being told. If I were to put it simply, it's just a montage of four very different people on a journey to reach what seem like four different destinations but is actually a single, common and in this crazy way, almost tangible mission: to find the person you want to be, the person you want to live your life as, and to be that person. And it's also so much more than that. Because the truth is, everyday, everyone of us is searching for that final checkpoint where you come to an epiphany that yes, you're happy now. That you made it. That yes, you're finally living now. And what's funny is that almost every author tries to weave that very same message into their every word; I mean, you'd think it would be an overused-beyond-the-point-of-return cliche, right? But it isn't, at least seemingly not in Take A Bow. And that's what makes this book amazing. It tells it like it is, with the sort of flow that pulls you into the book, lets you breathe in the emotions, feel the anxiety and live the bursts of happiness of the novel like they were your very own. The ending was perfect, too, if it were possible. I've read so many books that did have the potential for something great but ended up squeezing the life out of that potential with a really fantastical, pretentious ending. But this ended on a note that keeps you wondering what happens to the four of them, while keeping you content with the assurance that yeah, everything will turn out okay for them. So how do I sum it all up? It's about music, beautiful and mellifluous; it's about friendships, those that shatter and those that bloom; it's about love, inconstant and heartwarming; and it's about life, its mountain-peak highs and rock-bottom lows. "iya, betul.. buat siapa paketna?" I found my favorite contemporary book of 2012 and my new favorite author! You have no idea how much I love this book. It such a cute, adorable book! Take a Bow follows four unique, talented teenagers: Emme, Ethan, Sophie and Carter. I loved all characters, especially the member of Teenage Kicks: Emme, Ethan, Jack and Ben. Jack and Ben cracked me up throughout the book. It’s been a long time since a book has made me smile this much throughout the book, and even after I finished it, I had a smile o I found my favorite contemporary book of 2012 and my new favorite author! You have no idea how much I love this book. It such a cute, adorable book! Take a Bow follows four unique, talented teenagers: Emme, Ethan, Sophie and Carter. I loved all characters, especially the member of Teenage Kicks: Emme, Ethan, Jack and Ben. Jack and Ben cracked me up throughout the book. It’s been a long time since a book has made me smile this much throughout the book, and even after I finished it, I had a smile on my face. Carter is adorable, sweet guy. He really wants to be normal, to have normal friends, a normal life and not act all the time. Emme is a sweet girl; she’s very quick to forgive people. Ethan is kind of a reserved, quiet guy yet nice and caring. Sophie is a selfish, heartless and very manipulative. She uses Emme and Carter; she plays with their emotion. Even though she’s not my favorite, I really liked how she made the story more interesting. Take a Bow is written in four POV. I know some people, including me, get confused when a book is written in multiple POV but I didn’t have problem with this book, I didn’t get confused ones. I also loved how there is music in this books; it made the book more appealing. I think the characters were funny but also had depth and seemed real. I was able to relate to every single character. From the first moment I opened this book, I was smiling from ear to ear. This book went really fast for me, when I didn’t even want to finish it; it was that good. The way Eulberg wrote this book was amazing. The writing is so beautiful. It’s another reason that I fell in LOVE with this book. Eluberg sense of humor, writing style, characters, and storyline will draw you and keep you cozy. There is NOTHING I would change about this book. I can’t recommend this book enough! Every single person should pre-order this one; you won’t be disappointed. I have no doubt that if you are a fan of contemporary novels, music, and romance … you would adore this book. You are going to be missing a FANTASTIC book if you skip this one. Now, I’m going to have to look for my copy of The Lonely Hearts Club (it’s somewhere in my messy bookshelf) because I’m addicted to Eulbergs writing, story and character. This. Book. Is. Absolutely. The. Best. Book. EVER!!!!!!! This book follows four teens and each one is completely different. Emme, I can relate to her so much. She is in her best friend's shadow her whole life. So she finally speaks out. But what is so different in this book than the many others I read, is because they go to an arts high school. Their high school requires them to RE-AUDITION just to stay in school. That is a lot of pressure if you do that four times a year. ***Re-Read in March 2018 - I loved this book just as much the second time around. Once again, I read it in a day. I just adore pretty much everything about this. I very recently discovered Elizabeth Eulberg and have been working my way through her books. While I’ve enjoyed all of the ones I have read so far (especially Better off Friends), Take a Bow has become not just my favorite Eulberg book, but one of my favorite books of the year. I love ***Re-Read in March 2018 - I loved this book just as much the second time around. Once again, I read it in a day. I just adore pretty much everything about this. I loved the characters. The story is told from the 1st person POV of four students at a prestigious arts school: Emme, Ethan, Sophie, and Carter. I really enjoyed each of their perspectives. I loved Emme and how kind she was. I loved her relationship with her band members, Ben, Jack, and Ethan. Ethan came the closest to the “tortured artist” persona I was expecting for the setting, but it was never over the top. While he messed up plenty, he did really try and I loved him. Carter was the former child star who just wanted to have a normal life. He was so nice and I loved the friendship he developed with Emme. His part of the story is really focused on finding himself and while I appreciated it and did like him, he came across a little pretentious at times. I pretty much straight up hated Sophie at first, but as the book went on I started to kind of love to hate her. She could not be more different than sweet Emme and I couldn’t wait to see this mean girls get what was coming to her. As I’ve mentioned, I’ve been binging on Eulberg books lately and I think the thing that keeps making me come back is the character development. All of her characters are really well developed and I become deeply invested in them. I almost start to feel like they’re real people and I wish I was part of their friendships. This year I have been really into mysteries/suspense and have not had a lot of patience for anything else. These books have made me really start to appreciate a good character-driven story again. The only thing I didn’t really like about the book was how Carter’s chapters were formatted. Every time there was dialogue it had the character name and then a colon and then what was said. It took me a little while to figure out that’s it’s supposed to mimic a script. It didn’t work for me, though, because the rest of the text wasn’t like that. If the whole POV could have been written out like a script I think it could’ve been a really interesting narrative choice, but as it was it was just kind of distracting. Overall, I really loved Take a Bow. I read it in a day. I loved the characters and the friendship and even the catty egomaniac. I know this review does not do justice to how much I enjoyed this book. I can’t believe how long it has taken me to discover Elizabeth Eulberg. If you are a fan of YA Contemporaries, you definitely need to check her out. I won this book from Goodreads First Reads. I used to sing and have big dreams of the spotlight which is part of why I entered to win this book. I will admit that I somewhat delayed reading this book because I used do pageants and acting classes and I used to sing. Part of me didn't really want to go back to that world, but it wasn't all that I thought it would be, so no harm done. I liked that the book jumped back and forth between Emme, Sophie, Carter and Ethan for their point of view. I also r I won this book from Goodreads First Reads. I used to sing and have big dreams of the spotlight which is part of why I entered to win this book. I will admit that I somewhat delayed reading this book because I used do pageants and acting classes and I used to sing. Part of me didn't really want to go back to that world, but it wasn't all that I thought it would be, so no harm done. I liked that the book jumped back and forth between Emme, Sophie, Carter and Ethan for their point of view. I also really liked that the book started and ended with everyones view of their auditions to get into school and their graduation. I absolutely hated Sophie, the self-centered singer who only dreams of the spotlight. She made me so mad the entire time that my boyfriend and I were driving home from vacation. It got to a point where I would read certain things she said and I would laugh and tell him "Girlfriend needs to check herself before she wrecks herself." It was almost laughable how easy it was to hate her. Then there was Ethan who I also didn't like because of just how he was. I found that I actually didn't like any of my narrators because they all had so few redeeming qualities. Ethan was this prodigy who becomes a womanizing alcoholic at 17, but then blames it all on how he really feels. Emme was probably the best, because I loved to follow her as she found herself at Ethan's urging. I found Carter to also be nice, but a cliche as a former child star trying to find himself. Del material del que están hechos los sueños es una novela juvenil, con una historia sobre adolescentes que están en su último año de Artes Creativas y Escénicas, y que en este último año encontrarán muchos problemas. La única cosa negativa que le he visto a la novela, empezando por ahí, es la cantidad de personajes que hay. Hay una barbaridad de protagonistas y todos nos cuentan la historia en determinados momentos, eso en un principio me costó asimilarlo. Además al principio me liaba y no estaba segura de quién era cada personaje.Sin embargo, ese lapsus del principio se me pasó hacia la página cien cuando ya tenía claro quienes eran cada personaje. Emme sin duda es el personaje que más me ha gustado, tiene una personalidad adorable y tierna. Cada personaje tiene su caracterización marcada, su pasado y su presente, algo que me ha gustado mucho, pues ninguno queda en segundo plano ni es plano en sí. Sino que la autora ha trabajado mucho el perfil de los personajes. La historia tiene una trama sencilla pero entretenida. Cada personaje tiene su trama y su historia, se complementan todas entre ellas y da lugar a una novela muy entretenida y fácil de leer. El ritmo es bastante rápido, suelen haber hechos que agilizan la lectura y el hecho de cada dos páginas se cambie de narrador, también lo hace más rápido y fácil de leer. Me ha gustado mucho, pues lo he disfrutado. Ha sido una novela para pasar un rato entretenido, para salir de la rutina y de tanta fantasía. Una novela realista, sobre los sentimientos, el último duro año de instituto y la amistad. I have read one other book by Eulberg and after reading this book, I find that she writes books that equal a good sit back and enjoy kind of book. Take a Bow was enjoyable. I liked the characters. I cared about them and I enjoyed learning about them. Each chapter is written in a different perspective...or each character has their own time. I actually found that I enjoyed Ethan's view points more than the other characters. However, my favorite character was Jack. He was so funny! Carter was interesting because I have never known someone like him and his situation is somewhat unique, being a child star. So, his thoughts were interesting. I disagreed with his decisions in the book, but Eulberg made it work. Sophie was a great character. haha Her sections were hysterical to read through. I found that I just laughed at her. I feel Eulberg did a great job in taking the time to set up her character. I just loved hating Sophie. She was spectacular. I have known some people like her so to watch and see what happened in the end was so fun. Definitely worth the read just to see what happens to Sophie. Overall, an easy read. I probably could have finished it in one sitting but I took my time with the book. Fun and enjoyable. When it comes to the characters, I have to command Ms Eulberg for coming up with interesting, layered characters, but also for her writing since Take a Bow is told from four different POVs and each had a very distinct voice. Also, it was great to be privy to all four's thoughts and emotions and it definitively made the book stronger. Another kudo to Ms Eulberg for the intricate ways all four storylines connected and intersected each other :) Sometimes, when you read a book with multiple POVs, it feels a bit clunky, the change of POVs too abrupt... But in the case of Take a Bow, it flowed really well and it did feel like I was reading one book and not four stories. Oups, got a little carried away LOL. Back to the characters. I absolutely loved Carter, Emme and Ethan, they were great, real and so lovable!! I liked how Carter was so down-to-earth when it came to his fame, his acting career and his talent. He was just a nice guy, trying to figure out who was the real Carter Harrison and in no way was he spoiled or arrogant. I think it speaks very loudly of Carter's personality and the way he was raised. What I liked the most though was Carter's journey throughout the book, the growth and the maturity he gained. I liked that he realized that nobody was pushing him to be an actor, that all these years, he's misread his mother's behavior and action. She wasn't pushing him to be a superstar; she wanted him to be happy. I thought for him to walk away from acting to pursue his passion was both brave and wise. Emme, I loved Emme!! At first, she appeared to be shy and not confident, but the inner strength this girl has! I also loved her loyalty to her friends, even if someone might not have deserved it... and that part of Emme really made me connect with her. I've been in Emme's shoes where I knew I was being manipulated and used... But at the same time, it's hard to give up such a friendship that was so dear to you. Even then, Emme never stooped to the level of being mean or wanting revenge... And I loved seeing Emme coming out of her shell and gaining confidence. As for Ethan, I have to admit that I had some doubts at first. The guy definitively made some mistakes... But once you see the way he stood by Emme, always being there for her, loving her... He definitively redeemed himself. You can't help but loving him and root for him! And I believe that with Emme, he won't repeat the same mistakes. He has someone to ground him... Finally, there's Sophie. She was made to be the villain of the book and therefore is not very likable... and yes, in some ways, her character is a bit stereotypical. However, it doesn't make her character less real. What I liked is that Ms Eulberg didn't backtrack at the end, redeeming her character. Sophie is the way she is and does not change. I'm sure she did consider Emme as her best friend when she was younger, but truth is, the most important person to Sophie is herself. Even when she was dating Carter, she was already imagining their breakup - just before her launching her first release ^_^; Everything she did was to achieve superstardom and that's what mattered to her. In a way, you have to admire her determination and her will... even though she's going about it the wrong way. Creative and Performing Arts (CPA) -Sekolah Seni Kreatif dan Pertunjukan, New York- merupakan salah satu sekolah seni pertunjukan paling bergengsi. Tempat di mana anak-anak muda memiliki bakat luar biasa, tempat di mana mereka menggapai impian. Ada empat kisah dalam buku ini, empat passion yang besar dalam diri mereka terhadap seni. Dia mempunyai bakat bermusik luar biasa, bisa memaninkan berbagai alat musik dan suaranya, jangan ditanya. Masalahnya, dia tidak PD tampil di depan umum, dia selalu gugup dan jarang memperhatikan penonton saat beraksi di atas panggung, tidak punya ikatan dengan penonton. Seperti kebanyakan musisi besar yang sukses, dia tampil dengan bau alkohol untuk melepas kegugupan dan menciptakan lirik lagu yang hebat ketika hidupnya sedang kacau. Dia berusia lima belas tahun, kebiasaan inilah yang membuatnya pernah membuat teguran dari Emme, orang yang diam-diam dicintainya. "Sebenarnya, ada satu hal yang bisa kulakukan untuk menghentikan suara-suara itu. Satu-satunya keahlianku; bermain musik. Itu bisa aku lakukan dengan baik." Dia bodoh dalam hal berteman, tidak bisa membedakan atau tidak mau tahu kalau dia hanya dimanfaatkan oleh sahabatnya sendiri. Dia adalah pencipta lagu yang hebat, dia masuk sekolah seni karena sahabatnya mendaftar di sana, karya-karya lagunya dia ciptakan khusus untuk Sophie. Setelah bertemu dengan Jack, Ben, Ethan -bandnya- Emme sedikit lebih percaya diri, dia tidak hanya sebagai pencipta lagu, dia mempunyai bakat terpendam di balik sifat pemalunya, mempunyai suara yang luar biasa indah. "Sophie-lah yang jadi penyemangat terbesarku dari awal. Dialah orang yang menanamkan benih bertahun-tahun lalu mengenai CPA. Kami akan menjadi kekuatan yang tak terbendung, dinamik duo, tim penyanyi-dan-pencipta-lagu terhebat yang pernah dilihat CPA. Dia egois, dia ambisius, apa pun dia lakukan agar menjadi terkenal, hanya memanfaatkan Emme kalau ada acara atau audisi saja, selain itu dia melupakannya. Bahkan, dia memacari Carter karena dia terkenal, berharap ketenarannya akan menular padanya. Seeorang looser? centang. "Aku tahu di mana salahnya. Saat ini seharusnya aku sudah jadi bintang terbesar di sekolah. Orang yang akan diikuti dan dipanuti seluruh anak baru yang masuk nanti." Predikat artis cilik yang populer dan kaya raya tidak bertahan ketika dia beranjak dewasa, tidak ada lagi tawaran film bov office, dia sekarang hanya aktor opera sabun. Dia muak dengan hidupnya yang penuh dengan kepura-puraan, dia sudah bosan harus selalu berakting, dia ingin menjadi dirinya sendiri, melakukan sesuatu yang disukainya. "Aku tak percaya beritaku sendiri ketika aku disebut sebagai calon bintang besar, tapi lebih sulit lagi saat mereka menyebutmu sebagai kegagalan." Tantangan di Tahun Senior adalah akan ada audisi penyambutan murid baru, hanya ada sepuluh tempat di pentas. Selain itu semua kegiatan akan berpengaruh terhadap siapa yang berhak mendapat undangan untuk tampil di Pentas Senior. Sophie ingin sekali mendapat tempat utama di Pentas Senior, dia ingin menjadi terkenal, dan satu-satunya cara adalah menggunakan lagu ciptaan Emme. Sayangnya kali ini, bukan hanya dirinya saja yang unjuk gigi, berkat dukungan teman-teman band-nya, Teenage Kicks, Emme mampu tampil Solo, selain tampil bersama dengan band-nya, tentu saja, jadi dia tampil dua kali. Itu sangat membuat Sophie cemburu dan marah, dia pun berusaha sekuat tenaga agar bisa tampil di Pentas Senior. Lain lagi dengan Carter, dia sudah tidak berminat dengan CPA, dia memilih jalannya sendiri. Buku ini berisi impian anak muda, bagaimana mereka berusaha dan berjuang mendapatkannya, bagaimana mereka mencoba tampil percaya diri dan menjadi diri sendiri. Bagian favorit adalah ketika Carter bertemu dengan Sophie kembali, dan Carter mencurahkan perasaannya, bagaimana selama ini dia tertekan dengan suatu hal yang benar-benar tidak dia inginkan, tentang passion dia sesungguhnya. "Aku hanya sedang mengatakan bahwa jika semua yang kamu inginkan dari karier adalah uang dan ketenaran, kamu nggak akan pernah bahagia. Nggak sekali kamu pernah menunjukkan tertarik pada seluk beluk rumitnya pekerjaanku -kamu hanya tertarik berada di dalam sorotan. Kamu hanya bahagia jika mendapat perhatian, tapi kamu nggak akan bisa mulai dari puncak. Beberapa orang memang berhasil, dan akulah bukti bahwa ketenaran nggak akan selamanya. Tapi, jika menghabiskan seluruh hidupmu mengejar ketenaran, kamu akan menjadi orang yang sangat nggak bahagia. Dengan segala yang telah kulalui, aku mempelajari satu hal ini: ketenaran dan uang nggak berharga jika kamu nggak punya hal lain dalam hidupmu." Selain itu, menurutku dia sangat dewasa, tahu apa yang dia mau dan tidak ngoyo dengan impiannya. "Menakjubkan bisa melihat mereka manggung. Jika melihat mereka menyusuri jalan atau bahkan berdesakan di ruang tunggu, kurasa kalian takkan berhenti dan berpikir bahkan empat orang ini memang ditakdirkan bersama. Jack: cowok bertubuh besar dengan rambut kribo. Ben: cowok sederhana berambut pirang kecoklatan, bermata biru dengan bahagian memetik basnya. Ethan: tinggi (dia pasti hampir 190 cm sekarang) dan kurus, rambut hitamnya agak gondrong dan ikal. Emme: dengan rambut merah terang, kulit pucat berbintik, mengenakan pakaian serba hitam dan menggangguk-angguk mengikuti irama musik saat ia memetik gitar. Namun, meski terlihat berbeda, bersama di atas panggung, mereka adalah kesatuan yang lengtkap. Bukan persahabatan mereka yang membuatku iri; melainkan hasrat pada apa yang mereka lakukan saat ini. Jelas terlihat masing-masing dari mereka senang bermain musik. Itulah panggilan jiwa mereka. Itulah yang mereka inginkan." Karakter favorit saya adalah: Ethan! Yeay, saya sangat ngefans dengan dia. Bagaimana dia tampil mengagumkan di atas panggung dengan suara indahnya, bagaimana dia selalu membela Emme dan mencoba menyadarkan kalau dia hanya dimanfaatkan oleh Sophie, bagaimana dia sangat memperhatikan dan melindungi Emme, bahkan semua orang tahu perasaannya pada Emme hanya gadis itu saja yang tidak menyadarinya. Kehebatannya adalah bermain musik, kelemahannya adalah ketika dia tidak percaya diri, malu di atas panggung dan cemburu ketika Emme dekat dengan laki-laki lain, maka dia akan melampiasnkannya ke alkohol, typical sekali dengan bebrapa musisi besar. Tapi pertengkarannya dengan Emme dulu selalu menginggatkannya agar menjadi pribadi yang lebih baik bukannya malah melukai diri sendiri. Oh ya, jadi ingat tentang Jack yang meramalkan kisah edan tentang kematian Emme dan Ethan, haha, Jack ini orangnya lucu banget, penghidup suasana. Mungkin Ethan sudah mencicipi apa yang diramalkan oleh Jack, tapi semoga saja itu hanya guyonan :D.
"Aku mungkin sang penyanyi utama, Jack sang karisma, Ben sang jiwa, tapi Emme adalah jantung band kami. Di samping menjadi penyanyi utama, aku adalah cacat untuk band." Sudut pandang yang dipakai orang pertama, tiap tokoh bergantian di tiap bab, membuat alurnya cepat sekali, tidak membutuhkan waktu yang lama membacanya. Dengan pribadi yang berbeda-beda kita seakan ikut menyelami apa yang mereka rasakan, apa yang mereka inginkan. Minim typo, terjemahannya lumayan asik, pada dialog bahasanya lebih nyantai, seperti kalau kita ngobrol biasa. Untuk cover, saya lebih suka dengan cover aslinya, lebih fabulous, walau cover terjemahannya nggak begitu buruk juga :D.
Merasa kamu seorang anak muda yang mempunyai impian yang sama dengan mereka? Well, kamu harus mencoba buku ini. Apakah buku ini menarik untuk dibaca? Centang. Truly, the above statement is the theme of Take A Bow by Elizabeth Eulberg that makes this one contemporary novel extraordinary. It is all about musically oriented students growing up during their senior year at a performing arts school. The amazing characters learn new amazing lessons each step of the way. None of them are perfect but they are each searching for an answer to the question: What should be the next step I take in my journey towards a life of promise after high school ends? It is their senior year. The year Carter, Sophie, Ethan and Emmie have been feeling a paradox of feelings for; they feel a rush of excitement for their future while at the same time feeling unsure of who they want to be and what direction they want to go. This book means so much to me because next year is my senior year where I will have to discover which college I want to go to, how to best say goodbye to my high school friends and what job I want to prepare for. Take a Bow reveals the stress and anxiety performing arts students feel. The ins and outs of being in a band, of auditions. I am a proud member of my schools drama club where I lived through many amazing experiences acting in musicals and taking part in nerve-raking auditions. 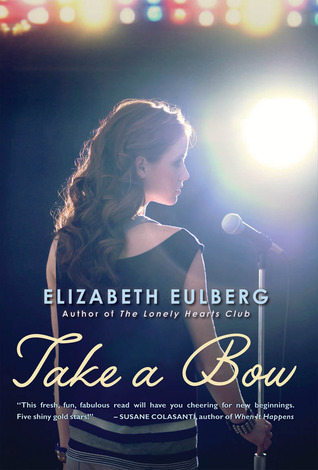 I completely adore Take a Bow by Elizabeth Eulberg because it is amazing, incredible and a one-of-a-kind story of friendship and disagreements. The characters are magnificent, the distinct points of views are outstanding and the story is full drama-filled excitement! Carter is my favorite because he, like me, is quiet and becomes nervous when deciding to take a new direction in life. I adore him because he is friendly and caring despite being famous. He knows that there is more to a successful life then money. All Carter wants to be is normal. I feel connected to Carter because I am also searching for happiness in my own right. Sophie is controlling, deceitful and deserves to receive karma. I enjoyed reading her chapters because I always wanted to look into the eyes of a girl who believes fame is the answer to being triumphant. Sophie is not likable but she has a flair in her that makes her mind exciting. Surprisingly I have a small factor in common with Sophie. Like Sophie, I enjoy singing the song “Send In The Clowns” from A Little Night Music. I find it inspirational! Ethan is an amazing imperfect character. His fatal flaw came from his nerves to be in front of a crowd. I totally understand the frustration he feels with dealing with the aftermath of his past mistakes of drinking and cheating. I admire his unwavering love for Emme and enjoy seeing how much he helped Emme throughout their senior year. He is a true friend despite his past mistakes. When he sang the sweet song he wrote for Emme, I was bursting with happiness. Emme is a radiant redhead who is the heart of Take A Bow. Emme is a caring friend, a passionate songwriter and is not afraid to put those who wronged her in their place. True, in the beginning of Take a Bow she completely does not realize that Sophie is a bad friend. But who wants to know that their childhood friend is a fraud. Before and during the story of Take a Bow, Emmie bravely reprimanded Ethan for his mistakes. She helped Carter be brave enough to reach his dream. She was loyal to her friends and bandmates, Jack and Ben. I am thankfully that she learns to trust that she is brilliant enough to be a songwriter. I plan to forever embrace the following grand themes that Take a Bow embodies. The journey and the friends who experience it with you is the most important part to a successful and happy life story. It does not matter where your talent lies; what matters is how you embrace it and that you believe in yourself. The story of Take a Bow is constantly changing. Every page adds a new thought, a new remark, a new moment to reminisce. Everything in this unforgettable book is a mark of true life. Trust me. Take A Bow By Elizabeth Eulberg is one story that you will wish never ended. Review posted to: Bookish Blog as part of the Contemporary Fiction Month feature. Visit for reviews, interviews, guests posts and giveaways! "Whoever said that people don't change was full of it. That or they never had a friend who wanted to be famous." Extremely well written, clever, and delightful, Take a Bow by Elizabeth Eulberg is an outstanding book. A book with a beating heart and exhilarating spirit, and one so ridiculously enjoyable it will have you totally immersed in its plot within minutes (bah! SECONDS!) from the moment you start reading. Elizabeth Eulberg deserves a standing ovation for the way she managed to write a novel from four (yup, got that right, 4!) different points of view, without ever making it confusing or awkward. In fact, she really did an excellent job on that front! All four voices are original, authentic, vibrant and compelling. Each of the characters has a story to tell (and not only Emme, Sophie, Ethan and Carter, but also the absolutely hilarious supporting characters, Ben and Jack), they're all friends (at one point or another in the story), they all have distinctive voices and unique personalities. Each one of them is a talented student, passionate about music and/or art, and they all share one common goal: going big, or going home. Their lives intertwine with each other, and Eulbeg did a magnificent job capturing the dynamics of their relationships, and how their decisions and actions affected one another. It was outrageously good. Eulberg's characters are all phenomenal to begin with. They are so real and full of life, it's almost too easy to connect with them, cheer and feel for them. You kind of feel like you've known them your whole life, and you end up living through all the little victories and heartaches with them. I think that's what I loved about this book, its ability to pull me in and get me emotionally involved. It was remarkable! I loved the premise, too. To be perfectly honest, I did not expect to be so fascinated by a book about a bunch of kids trying to become famous. I was sceptical. I'm not big on Glee and all the musical talent shows, I don't hate them - they just don't interest me all that much. I was prepared to lower my expectations, keep my mind open and, at the very least, try to get through this book without being disappointed. Imagine my surprise when I realized that I actually loved this book so much better than most of the paranormal or dystopian books I've read so far. It blew my mind, really. I won't even try to deny that. It was glamorous and inspirational, sparkly, charming, funny, entertaining, sweet! The chemistry between all the characters was crackling with intensity and emotions. I was amazed. Most importantly, though, this book was also quite deep and meaningful, it carried some profound messages about life, friendship, the importance of pursuing your dreams and never giving up. And, above all, being yourself and not conforming to other people's expectations. Take a Bow was all that and more. I loved how fun and entertaining it was, although the incredible complexity and depth of it is what ultimately made this book for me. Plot: ...Ok. Saya sempat kaget dengan time skip-nya sih. Ternyata prolog toh. Gaya bercerita: Sudut pandang orang pertama, semuanya berbeda-beda tiap chapter. Emme, Carter, Ethan dan Sophie adalah empat orang yang memiliki alasan tertentu untuk masuk CPA. Sophie yang mengejar karir dan lampu sorot tentu saja memaksa sahabatnya, Emme untuk ikut masuk ke CPA. Meski berbakat, Emme tidak seperti Sophie yang percaya diri. Tapi jika itu demi sahabatnya, maka ia akan berusaha. Berbeda dengan Sophie, Carter sang bintang yang sudah terkenal semenjak masa kanaknya menginginkan hal wajar dikehidupannya. Sekolah adalah salah satunya. Dilain pihak, ada Ethan yang malah masuk CPA atas paksaan. CPA mungkin dambaan para anak muda, tetapi yang bisa berdiri diatas lampu sorot sebagai bintang-nya, hanya beberapa orang. Mampukah mereka semua mengejar target mereka? Ah. Sinopsisnya sulit dituliskan. Tapi saya rasa itu lebih mending daripada sinopsis asli Take a Bow yang IMHO agak tidak menarik. Seperti tak ada bayangan mengenai isi ceritanya. Tapi memang benar sih, fokus buku ini pada sahabat dan cinta. Buku ini memiliki empat tokoh utama. Tiap chapternya, pemilik sudut pandang selalu dituliskan jelas, sehingga pembaca dimudahkan dalam mengetahui 'Siapa ini?' ^ p ^ (mwahaha). Plotnya juga berjalan tanpa mengulang ini itu yang tidak penting. Nah kalau penokohan, itu lain cerita. Karakterisasinya sepertinya bagus-- tapi saya tidak begitu suka sih. Soalnya ekspektasi saya malah digiring ke plot standar dengan persahabatan palsu. Saya menyayangkan sifat Sophie. Padahal saya pikir antara Sophie dan Emme, mungkin ada persahabatan yang saling peduli. Maksudku-- memang ada lho, sahabat yang mungkin salah satunya lebih loyal dari yang satunya. Seperti seorang sahabat yang ingin melihat sahabatnya bahagia dan lebih senang lagi. Ia pun bisa membantunya dalam banyak hal meski orang lain mungkin merasa dia terlalu dibodoh-bodohi. Tapi yah ternyata penulis menggiring ke masalah standar. Dan. Itu. Bukan. Hal. Terakhir. Yang. Saya. Tidak. Begitu. Setuju. Dari. Buku. Ini. Ada juga hubungan Emme dan Ethan juga saya tidak suka. Jika Ethan memandang Emme sebagai hadiah utama dan mantan pacarnya adalah hadiah yang diambil karena tidak dapat memenangkan si hadiah utama, maka dia pantas untuk tidak mendapat keduanya. Bahkan sampai pernah selingkuh! Bagaimana coba kalau lain kali dia mendapatkan lagi hadiah utama yang lebih gemerlap dari Emme? Tokoh bermulut manis pada orang yang disukainya seperti ini menurut saya bakal menghadiahkan hubungan yang retak jika cerita ini dilanjut X"D.
Saya teringat tokoh Raya dari novel Rival (Amalia). Berbeda dengan Ethan, meskipun punya keinginan memenangkan Aline, dia sadar kalau ada perbedaan antara keinginan menang seorang lelaki dan rasa sayang yang sebenarnya. Makanya, dia tetap bersama pacarnya yang memang pantas dicintai, diluar sikapnya kadang-kadang (」ﾟﾛﾟ)｣ . Last and (of course) least, let me take a bow and... *aiming to three star* //bowpanah //bukanhormat //lhe. Take a Bow is a short but surprisingly emotional read, thrusting into the midst of a creative and performing arts school as four very different students try to find their way through their classes, their futures, and their individual relationships. The fact that there are four first-person point of views packed into an under three-hundred page story may cause some readers to balk initially–questioning whether or not there will be enough time to adequately connect to each character before reachin Take a Bow is a short but surprisingly emotional read, thrusting into the midst of a creative and performing arts school as four very different students try to find their way through their classes, their futures, and their individual relationships. The fact that there are four first-person point of views packed into an under three-hundred page story may cause some readers to balk initially–questioning whether or not there will be enough time to adequately connect to each character before reaching the last page–but Ms. Eulberg does an extremely impressive job of layering each character and giving them the means to pull a strong, visceral response from us however brief our sojourn into their heads and hearts. Watching as the relationships change between the four narrators as well as the side characters is entertainment at its finest, each one of them flawed and in various stages of recognizing those flaws so they may get out of their own way and grab onto the future that’s waiting just beyond their self-constructed walls. Emme and Ethan are perhaps the two characters with whom we spend the most time, their relationship consisting of deep friendship (and unrequited love on Ethan’s part) the most emotional of the four threads woven together to create this beautiful patchwork of a story. Emme is endearingly naïve and a genuinely good person, always the first to help any of her friends should they need it, and utterly unsuspecting of any type of subterfuge or petty jealousy to the extent that we often want nothing more than to reach in and force her eyes open wide so she can see what everyone else around her already does. Her eyes do eventually open much to our immense relief, and once they’re open they remain blissfully clear and she never allows her vision to be clouded by a manipulative farce of a friend again. She goes from a meek, quiet young woman content to her place in the shadows to a strong and confident young woman who’s still plagued by nerves, but who no longer allows herself or those around her to stand in her way. Ethan has our hearts from the opening pages, his feelings for Emme as obvious to us as Emme is oblivious, and we immediately enter into a love/hate relationship with him—loving his protectiveness of Emme while simultaneously hating that he protects her even from himself. His flaws are probably the darkest and most numerous, his self-destructive behavior a burden he bears not alone, but rather one he unintentionally shares with Emme and those who most care for him, weighing all of us down until our toes brush bottom and he begins to push off and drag us all back toward the surface. Despite his behavior, he is nothing if not worthy of redemption and affection, his clear love for Emme something painful and stunning at the same time as we honestly have no idea as to whether her feelings for him can be what he so desperately wants them to be. Ethan and Emme are definitely the strongest of the four narrators, our time spent with Carter and Sophie not quite as complex or interesting as the maelstrom of emotions constantly swirling around the other two. Carter’s chapters are written in script-like form, something a bit jarring given the other three perspectives have no such clear distinction, and while we understand why it’s done that way given Carter’s entire life has been scripted for him, it seems just a touch out of place. Overall however, Ms. Eulberg has written a story rich with intriguing relationships where all the beauty and pain that accompanies change is laid before us in glorious detail. I don't give out 4 stars easily. It takes a lot to impress me with a book (mostly because I'm picky and I know what I want). However, I went into Take a Bow with high expectations due to some extraordinary reviews, and I'll admit I was genuinely impressed with what Elizabeth Eulberg managed to pull off. Take a Bow follows 4 very different people through their journey at the School of Creative and Performing Arts in New York. This prestigious school is not your typical high school - it's essentially for those who have creative gifts and talents. From singers and musicians to actors and painters, this is where the creative shine. Each of these 4 characters have different reasons they're at this school, different talents, and strikingly different personalities; and we follow them as they learn about some very important lessons about love, friendship, and following your dreams. For those of you who don't know, I'm an actress. Theatre is my passion. Being up on stage gives me an adrenaline rush like nothing else. Because of this, I was able to connect to Take a Bow in a way that some readers might not have been able to. I really liked Eulberg's writing in this. It wasn't necessarily overly eloquent or descriptive, but it was sweet and really fit the characters. It legitimately sounded like a teenager was narrating, and I really appreciated that. If you read the description for this story, it mentions the story is narrated with four POVs. Now, while this may sound intimidating at first (and for good reason! ), I'd like to say that I really felt this style was well-done. Normally when reading a book with multiple POVs the concern is that sometimes all the different POVs blends together. Not with Take a Bow. Each POV has a distinct and personable feel to it, and you can immediately tell who is narrating without even needing to check the chapter headers. As for the characters, I really liked the development Eulberg put into each of them. They're all distinct and unique and have their own personalities and motives. Emme is - essentially - the main character of the story. She's been composing songs for her best friend Sophie for as long as she can remember, letting Sophie sing them; and she's content being out of the spotlight. But now? She realizes she may just have a hidden talent ready to shine. Sophie is a talented singer whose goal is to become famous. But what if that plan doesn't quite work out? Who would she be then? Carter is a former child actor with a secret: he doesn't like acting anymore. He wants to be an artist. But is he able to put people's expectations of him aside to follow his dream? Ethan has liked Emme ever since he first met her. But is there any way he could get her to see he's more than just a fellow band member? This wasn't an easy read and contemporary isn't usually my thing, but I wanted a change of pace after my last couple of books and hopefully I've kept this review fairly objective. Anyway, yeah, I had some problems reading this; it's a fairly interesting concept but the execution needs work. The book’s from an ensemble first person point of view, and each narrator (Sophie, Emme, Ethan, and Carter) alternates chapters, though that's not the problem. At least for me, it was pretty easy to tell who' This wasn't an easy read and contemporary isn't usually my thing, but I wanted a change of pace after my last couple of books and hopefully I've kept this review fairly objective. Anyway, yeah, I had some problems reading this; it's a fairly interesting concept but the execution needs work. The book’s from an ensemble first person point of view, and each narrator (Sophie, Emme, Ethan, and Carter) alternates chapters, though that's not the problem. At least for me, it was pretty easy to tell who's narrating which chapter - even without looking at the chapter headings - Carter's are written with a lot of the dialogue in script form, Emme's is the most nervous, Sophie's is incredibly b-y, and Ethan's are judgmental and self-loating. The first four chapters are each of the four characters setting up their expectations before high school, the last four are them reflecting at graduation, and the rest takes place during senior year. All good right? Except at various points during the narration, these narrators would reflect back on events during the other three years of high school, and the only warning is a little line like 'I remember back during...' A little italics or spacing or something would've been really helpful. Beyond that, I really liked only one character, found another one merely OK, the third boring, and absolutely hated the last one (if you're wondering, in order that'd be Ethan, Emme, Carter, and Sophie). I guess that’s mostly intentional, because Ethan and Emme got the best plot of the four, and I can relate to a guy who acts like a jerk but realizes his mistake (yeah, done it too…). I can also more or less understand a girl who hangs on to a best friend who treats her badly. And I can understand adding in a rather clichéd character going through the I feel empty despite my success and want to find myself by doing something else thing to fill out a couple more pages. What I don’t understand is Eulberg’s choice to write from Sophie’s POV. This could’ve been interesting because the other characters don’t have a good opinion of her and she could’ve explained her attitude better, but no, just like everyone says she really is a b-, and who wants to read the opinions of a complete b- with delusions of grandeur? By the time I got to her last rant, I was more than ready to be done with her character. Take a Bow really makes me wish I didn't have a rating system. I would give this book more than five stars without ever having a second thought. Elizabeth has written a Contemporary novel that embodies everything I love to see in a Contemporary, and more. It's such a cute and thoughtful story. I honestly think it's a perfect story for any type of reader. I love how Elizabeth wrote these characters, you follow the four characters which you see mentioned in the excerpt (Emme, Sophie, Ethan and Cart Take a Bow really makes me wish I didn't have a rating system. I would give this book more than five stars without ever having a second thought. Elizabeth has written a Contemporary novel that embodies everything I love to see in a Contemporary, and more. It's such a cute and thoughtful story. I honestly think it's a perfect story for any type of reader. I love how Elizabeth wrote these characters, you follow the four characters which you see mentioned in the excerpt (Emme, Sophie, Ethan and Carter). The reason I enjoy the way Elizabeth wrote the characters is that each chapter focuses on one of the four characters. You will see them cross over into each others chapters obviously, but it's really nice to get to see the different situations through each of the characters eyes and see how they all react different. I really became attached to these characters, especially Carter and Emme these two characters were by far my favorite. I loved that they came from completely different backgrounds, but in the end they ended up having the same goals. I don't think I will ever be able to bring my self to like Sophie and Ethan though. Just not a fan of either character... Ethan does redeem himself somewhat throughout the book, but there are just certain things I can't look past that doesn't allow me to like him as a character. When it comes down to it though, all of the characters are written extremely well regardless of how I felt about them. Having well written characters, and making them seem really helps to make a wonderful story and Elizabeth was able to accomplish that in a spectacular way in Take a Bow. I just can't get over how wonderful of a story this was, of course it's one I would recommend to everyone. I really hope you all will take the time to read this book, it's a stunning Contemporary written by an extremely talented author. This book deserves much more praise than I could possibly give in this one review. But I hope I am at least able to persuade you to read this book once it's released, and continue to spread the word about it. I feel like a say this a lot in my positive reviews, but it really is well worth it. Tapi berhubung keterbatasan dana dan niat, saya baru bisa punya piano waktu sudah kuliah. Guru piano yang saya datangi sampai takjub karena katanya jarang ada yang memulai les di usia 'matang' seperti saya waktu itu (mau bilang ketuaan nggak enak kali ya). Tapi yaah...namanya juga nggak berbakat, atau tekadnya kurang kuat, atau jari-jarinya udah terlalu kaku (alasan!) akhirnya les saya berhenti di tengah jalan. Ditambah lagi guru piano saya yang baik hati pindah ke cibubur, makin malas lah saya ngejarnya. Kenapa nggak cari yang lain? Soalnya cuma dia yang kasih harga murah ke saya, ya karena dia kagum aja sama semangat saya untuk mulai les di usia matang. I'm a huge fan of Elizabeth's books so I went into this with really high expectations- they were blown away! I absolutely adored this book!!! As with Elizabeth's prior books Take a Bow captures the teenage years perfectly. This book is the story of four students in a performing arts high school. I wasn't a performer in high school but the majority of my friends were in choir or theater so much of the competition and drama that takes place in the book was very familiar to me. The joy, the passion, I'm a huge fan of Elizabeth's books so I went into this with really high expectations- they were blown away! I absolutely adored this book!!! As with Elizabeth's prior books Take a Bow captures the teenage years perfectly. This book is the story of four students in a performing arts high school. I wasn't a performer in high school but the majority of my friends were in choir or theater so much of the competition and drama that takes place in the book was very familiar to me. The joy, the passion, and the heartbreak was all spot on. These students journey to discovering who they truly are and what they really want to be is one that is familiar to everyone even if they aren't into the performing arts. When I finished this book I had tears in my eyes and a huge smile on my face. I honestly loved or hated all the characters in the book. I can't really say more without spoiling anything but take my word for it you want to read this book. You will love it!! One last note: I'm not a fan books that are written from multiple points of view. I find them to be confusing and very rarely do they flow well. I admit that I when I realized that Take a Bow was from more than one point of view I rolled my eyes and inwardly groaned. But I was very pleasantly surprised that I never had to question who was speaking, each character had a very distinct voice and the story flowed naturally. For some reason, I just couldn't get into this book. And, I really, really wanted to like it. I LOVED The Lonely Hearts Club The Lonely Hearts Club- Elizaebth Eulberg really nailed everything in that one-but Take a Bow was unfortunately a disappointment.The characters are stereotypical and two dimensional in a very annoying way, and quite frankly it is a predictable read. Predictable is not necessarily a bad thing, but this novel is the boring sort of predictable... In all, the setting of a perf For some reason, I just couldn't get into this book. And, I really, really wanted to like it. I LOVED The Lonely Hearts Club The Lonely Hearts Club- Elizaebth Eulberg really nailed everything in that one-but Take a Bow was unfortunately a disappointment.The characters are stereotypical and two dimensional in a very annoying way, and quite frankly it is a predictable read. Predictable is not necessarily a bad thing, but this novel is the boring sort of predictable... In all, the setting of a performing arts school, which was very enticing, was not enough to redeem the poorly developed characters and plot. The book isn't terrible, but it's not something that I would read again or encourage anyone to buy. I loved the author’s writing style and storyline! I thought one character was a little annoying but it was a quick and easy read. This review has been hidden because it contains spoilers. To view it, click here. As a vocal performance major, this book really kind of spoke to me. Or, rather, shrieked at the top of its lungs at me. Unfortunately, the volume of its delivery (and all the other thinking going on in my head) made the message unclear. For me, reading this book was kind of like standing next to the Amtrak engine in Union Station at rush hour when the trains aren't running on schedule: The Amtrak engine is hissing and clacking and thrumming and sometimes groaning, and the other passengers are al As a vocal performance major, this book really kind of spoke to me. Or, rather, shrieked at the top of its lungs at me. Unfortunately, the volume of its delivery (and all the other thinking going on in my head) made the message unclear. For me, reading this book was kind of like standing next to the Amtrak engine in Union Station at rush hour when the trains aren't running on schedule: The Amtrak engine is hissing and clacking and thrumming and sometimes groaning, and the other passengers are all talking one their phones or to each other, and you're standing on the platform thinking, "Is this the train I want? Is it? Did they move it? Where do I need to be?!?" And then the announcement comes on: "Attention Metra BNSF commuters: Your 5:32 train … (echo distortion) … arrival of equipment. Metra commuters for the 5:32: Your train is now –(Amtrak engine noise)– logize for this inconvenience." But being able to identify with the characters is only important because they all change. (Or at least all the characters I identify with do.) Each of the three I liked learned some important lesson about themselves or coping or life or others or some combination thereof by the end of the book. I don't mind giving a spoiler now and then (I have learned to give ample warning ever since the incident with my sister and The Sixth Sense. ), but telling you everybody's lesson is more than I can bear. So I won't. Suffice it to say there are lessons learned. This is the first book by Elizabeth Eulberg I read, and I must say that she absolutely made me fall for her writing as soon as I opened the book to the first page. Here I add another contemporary author to my top list. Take a Bow is a meaningful and and highly compelling story that, whether you are a contemporary fan or not, is definitely a must-read! Truth be told, I wasn't expecting to love this book SO much. Don't take me wrong. I already loved the premise before even turning to the first page, especially since I love music! (I used to study singing) and I am currently a student at the Fine Arts faculty myself. But truth is, Take a Bow wowed me in such a way that it took me by surprised. Now I am pretty sure that Take a Bow will probably remain as one of my favourite 2012 contemporary reads! Told from four different points of view, Eulberg narrates the story of two girls and two boys' senior year at a performing art school. I really love how Eulberg approached these four different points of views and the way she entangled them to develop the story of these students. I also love the use of first person narration. I think it makes the story very dynamic as well as it gives a stronger taste of the characters’ experience. Emma, Ethan, Carter and Sophie have to go through a lot more than just auditions. Actually, I could name an extended list of topic and themes that Eulberg knitted around the characters' life but I denied myself to give anything away! Just rest assured that Take a Bow is so much more that an engaging, fun and fast-paced read. You HAVE to read it! Who would believe that in 278 pages (divided by four since there are four different POV) characters could be so well developed? Well, believe it because one of the brightest things about this book is the characters. Emma is probably the character with the kindest heart I have ever read. She is also beautiful and different, but her selflessness and naïveté are certainly the two things that make her even more special. Ethan, Oh Ethan! He is the incarnation of every girl's rock/metal idol! (Dear Tuomas Holopainen, I just found your fictional You), Carter is another admirable character that, regardless being already a popular actor with an account filled with millions, is still searching for what makes him really happy. Sophie in the other hand is the bad mean girl who will claw her way to the top no matter what she has to do, no matter who she has to hurt. Those are the four main character whose live we follow, but there are other characters as well that are as extraordinary as the main characters. Take a Bow is definitely a book you don't want to miss! Take a Bow is filled with beautiful messages. It is a meaningful story about dreams, hard work, love, friendship, betrayal, fame, and the ups and down of life. This contemporary novel will certainly be a precious addition to everyone's shelf. If you haven't read this book yet, what are you waiting for? I'm a huge fan of books (and movies/TV shows) that deal with people trying to "make it" in the entertainment industry. This interest has led to me watching movies like "Fame," eating up every last bit. I also really liked Elizabeth Eulberg's previous novel, Prom & Prejudice, so I was excited to see her writing about one of my favorite topics! This is a short little book that I read in one sitting. It's told from four different perspectives, and it's super fast-paced. The four main characters couldn't be any more different. You've got Carter, the former child star who is now a regular on a daytime soap and trying to decide if he's actually still interested in acting. Then there's Sophie, who is determined to graduate high school with a recording contract, and she'll do whatever it takes to reach her dreams - including using her friends and boyfriend to get ahead. Emme is the soft-spoken songwriter that grows a lot during the book, and Ethan must deal with a lot of inner-demons before he can ever become successful. Emme is really the main protagonist of the story, and she propels the plot. She was a good MC, though I thought maybe her character development was a little too extreme. She and Ethan are best friends, but it's clear at the beginning that Ethan is more talented. However, as the story progresses, Emme begins to overshadow him. I didn't like that her talent made him less talented, and she ended up becoming the better songwriter. Also, he was a little too dependent on her, like his world revolved around her - a little too much girl power for me. But other than that, I really liked this book! Sophie is ruthless, and I loved to hate her. And her friendship with Emme was really interesting. I liked watching Emme make excuses for Sophie until she just couldn't take it anymore. I think this sort of frenemy relationship is one that a lot of girls deal with at some point in their lives (if not always), so I think that's a really relatable topic. Then you've got the music aspect, which was wonderful. Honestly, that's what I loved the most. I liked when Emme and Ethan would talk about songwriting, when Sophie would dream about getting a Grammy. This book reminded me A LOT of the movie "Fame," with the overwhelming pressure these kids have to face. I kept wondering if it was all worth it for them, and the different characters come to different conclusions, which I loved. Normally I give myself a day or two after I've finished reading a book to let it all sink in before I start to write up my review, but not so much with this one. I couldn't wait to create the post for this title. I think it's safe to say that if I were asked to pick my top five favorite authors, Elizabeth Eulberg would without a doubt be one of those writers. I can't even really pinpoint why that is exactly, or what makes her writing stand out better than the others, but there's no denying that Normally I give myself a day or two after I've finished reading a book to let it all sink in before I start to write up my review, but not so much with this one. I couldn't wait to create the post for this title. I think it's safe to say that if I were asked to pick my top five favorite authors, Elizabeth Eulberg would without a doubt be one of those writers. I can't even really pinpoint why that is exactly, or what makes her writing stand out better than the others, but there's no denying that it does. I think if Eulberg ever decides to pack it up and stop writing, we'll all be denied a fantastic talent that does not come along very often. Her books are all so different and unique and yet they always have the same warmth and magnetism that draws readers in to the pages. When I opened this book up I knew that I would like it. I've yet to find one of her novels anything less that wonderful, but each and every time, including this one I'm still surprised by how much I enjoy myself while reading her work. I had flown through more than half of the book and didn't even realize that I had skipped a meal and neglected pretty much everything else that was going on around me at the time. But it didn't matter, finishing the story and seeing what happened to these lovely characters was all that was important. So I managed to read this one cover to cover in two sittings. If I had started this one on the weekend I wouldn't have gotten up for anything, but with work, I couldn't avoid having to put in my eight hours at the office. Emme, Ethan, Carter, Ben, Jack, they were all fantastic! The band...oh I just loved the band! Each of these characters have their own unique personality and bring something great to the table, but all together they create this wonderful story that I can only thank Eulberg for sharing with her readers. Even though I wish she was one of those authors that churned out a book every couple of months, I understand that part of the genius in her writing is that it's not rushed, it flows from page to page and grips the reader with it's intensity and has us invested in these character's futures as if they're not fictional characters, but our very own real life friends and family. The characters were hard to connect with, and I probably rolled my eyes several times. Also, why are the composing students basically only writing songs for singers and rock bands? Perhaps they should be labeled Singer-Songwriter students instead because I almost doubt in a competitive school they would get in over instrumental composers... That constantly bugged me. And since when do really good musicians have the time to be good at several. This is incredibly rare, and even then they play few. (Conrad Tao on violin & piano is a fine example of succeeding on two.) I am referring to Emme. AND THEN AGAIN WHY IS IT ALWAYS JUILLIARD??? Nothing against Juilliard, it's one of my dream schools and has a fantastic flute faculty, but it's so overused in media. The author did mention Manhattan School of Music and Oberlin, but what was also confusing was that in the book it said only Juilliard required pre-screen auditions. I'm pretty sure all of those schools do. At least I know for sure MSM. I just didn't enjoy this book as much as Eulberg's others. The book was quite clean, which I appreciated. Just a bit weak. If you haven't read anything by Elizabeth Eulberg yet...I highly suggest you stop reading this review and go to your nearest library or bookstore and pick up one of her books! Her books are not only well written and interesting,but they also contain important messages. For these reasons, her books have qucikly become some of my favorite Young- Adult Contemporary novels ever. Her latest novel, Take A Bow has to be my favorite of her three books. It follows four very different high schools (Emme,So If you haven't read anything by Elizabeth Eulberg yet...I highly suggest you stop reading this review and go to your nearest library or bookstore and pick up one of her books! Her latest novel, Take A Bow has to be my favorite of her three books. It follows four very different high schools (Emme,Sophie,Carter and Ethan!) as they go through their journey of trying to be successful and being truly happy. Before picking up this book I did not realize that each chapter would be narrated by a different character and I was pleasantly suprised to see how this really added to the development of each character as well as to the plot! El libro está dividido en tres partes: los castings, la introducción en la que conocemos a los personajes, último curso, la parte principal del libro donde sucede toda la trama en la que los cuatro personajes narran desde sus diferentes puntos de vista lo que les va sucediendo a lo largo del último curso en el CAE, y la graduación, un final en el que cada personaje reflexiona sobre su evolución a lo largo de los cuatros años en el CAE y sobre su futuro. De tal forma que una vez que empiezas no p El libro está dividido en tres partes: los castings, la introducción en la que conocemos a los personajes, último curso, la parte principal del libro donde sucede toda la trama en la que los cuatro personajes narran desde sus diferentes puntos de vista lo que les va sucediendo a lo largo del último curso en el CAE, y la graduación, un final en el que cada personaje reflexiona sobre su evolución a lo largo de los cuatros años en el CAE y sobre su futuro. De tal forma que una vez que empiezas no paras de leer y pronto llegas al final, dado que no tiene capítulos no me fue para nada fácil dejar a un lado la lectura, tenía que acabarlo y saber qué pasaba a continuación. Toda la historia de los personajes gira entorno a su último año en el CAE, el Instituto de Artes Creativas y Escénicas de Nueva York, y en torno a todas las rivalidades del mundo de las artes escénicas. Pero a pesar de eso sigue siendo una historia de amor y amistad, que nos enseña a superar los miedos y a enfrentarnos a ellos para luchar por lo que uno quiere.